No, I am not wishing a Happy Birthday to a law firm that represents the Yankees. Before New York made it back to the World Series in 1976, George Steinbrenner was constantly prodding the Yankee front office to acquire and experiment with players that might help the Yankees get there. Usually, these were veterans who at one time or another had done something noteworthy in their careers. 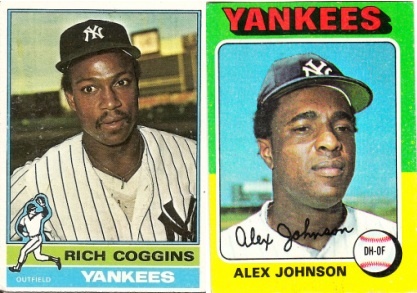 Two such players, both outfielders and both born on the anniversary of the Japanese attack on Pearl Harbor, were Rich Coggins and Alex Johnson. Just two years before New York purchased him from the Expos, Coggins had batted .319 during his rookie season in Baltimore. Although that average plunged by close to seventy points the following year, the speedy Indianapolis native stole 26 bases for the Birds in 1974. He got into 51 games for New York in 1975 but batted just .224. It was evident he had lost the stroke and confidence he exhibited during his rookie season. A bad stroke or lack of confidence were never problems for Alex Johnson. Born in Helena, Arkansas in 1930 and raised in Detroit, Johnson had been a .300-hitting outfielder on the early version of Cincinnati’s Big Red Machine teams of 1968 and ’69. He had also won the AL batting title when he hit .329 for the 1970 Angels. Alex’s problems were his unfriendly personality and horrible defensive skills. The Yankees purchased his contract from the Rangers in August of 1974. He hit just .214 for New York the rest of that season and then just .261 as a part time DH in 1975. The Yankees let him go after that season. The most famous Yankee to be born on this infamous date is this first baseman who won four rings during his stay in the Bronx and this six-time Gold Glove winner.